Pilot: AMC and DC's latest graphic novel-turned television series is a bit of an odd hybrid. Firstly the source material is immensely popular amongst adult graphic novel readers, which admittedly is not a big population, but look where The Walking Dead is at now. Secondly, it is coming in at a time where comics are at a high in terms of movies and television, the latter of which is where DC is succeeding much better than Marvel. Anyways, style-wised, Preacher is a lot like Quentin Tarantino meets Alan Ball with a whole lot of Seth Rogen, i.e. stylised violence with some supernatural dark humour but in a cheesy, B-grade sort of way. However, they never really commit to one style unlike True Blood or Scream Queens (at least that horrific Ryan Murphy abomination had the balls and decency to stick to its ridiculousness throughout). The pilot chose to go with an origin story instead of starting the story in media res and because of that, the whole 60-odd minutes felt like one very long prologue where they ended up telling a lot more than showing. Pilots are already leaden with the arduous duty of being exposition heavy to introduce the characters, the story and the central conflict, but here nothing really happened till the 51-minutes mark. Everything before that was padding. The only really great moment was the introduction of Ruth Negga's Tulip. Joe Gilgun's Cassidy is still a mystery but yet the way he was introduced does not really make him that interesting a character (note to Seth Rogan: that whole Martin Scorsese's Wolf of Wall Street-esque sequence was such a sad, pathetic rip-off). Then of course we with Dominic Cooper's eponymous (anti-)hero. The ex- (or current) young Howard Stark has an annoying wavering southern accent and plays Jesse Custer so vaguely that we never really know who he is or who he thinks he is. And what's up with Lucy Griffith? 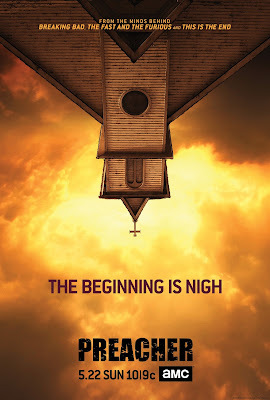 After this pilot, I am intrigued by the premise to stay on a few more episodes to see how it goes, but that is mainly more because of the pedigree and the tease that it could be a dark horror comedy to fill the void that was True Blood.